La Villa Salafa se trouve à proximité de la Bang Tao Beach. Elle dispose d'un magnifique jardin verdoyant et de six chambres spacieuses qui peuvent accueillir les personnes à mobilité réduite, qui la rende idéale pour les voyage en famille ou entre amis. Vous disposerez même d'un chef et de votre propre voiture privée qui vous emmènera à certains endroits de la côte ouest de Phuket. A la Villa Salafa, vous passerez à coup sûr un séjour luxueux et agréable. Phuket est une destination de rêve pour un certain nombre de voyageurs. La Villa Salafa, située sur la côte ouest de Phuket, offre aux clients un cadre relaxant, loin des zones les plus occupés. Elle se situe à côté de Bang Tao Beach, où vous pourrez profiter d'un bon bain de soleil en famille ou entre amis. Le soir, vous découvrirez pleins d'endroits pour boire un verre, comme le Dream Beach Club sur Layan Beach et le Nikki Beach Club Phuket, où vous pourrez profiter de spectacles. 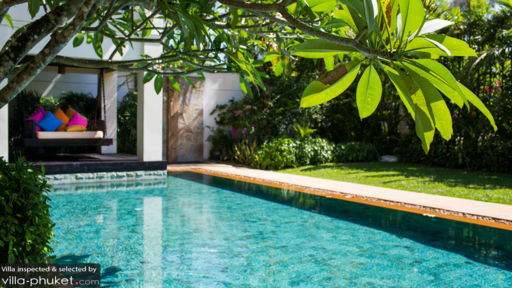 Bien que la villa soi calme et relaxante, vous pourrez également visiter le Banyan Tree Spa Phuket pour un bon massage. As for our stay at your villa, the villa itself is a very nice, comfortable and warm place with good facilities. Bee the housekeeper is a very friendly, approachable and accommodating person, with very good culinary skills and we actually stopped eating out, as her dishes were far tastier than any Thai food we had eaten outside. She is always happy and greets everyone with a smile and a very kind person, manages the villa extremely well. Noon, Bee's assistant is also very friendly and helpful and compliments the expertise of Bee. Kim the van driver, knows his road network and locations of places well, he is a very safe driver and very obliging with changes in plans and timing. Overall the staff were great and with our large group they went an extra mile to take care of differing needs and requests, so this made our stay are very comfortable and a memorable one, it was "home away from home". The villa owner (Bill) and his assistant (Angie), were very prompt, professional and accommodating our inquiries and friendly people to deal with, we looked after the villa as if it was our own home and had no problems with getting the deposit refunded in full and promptly Without any hesitation I would recommend your villa and service of your staff to any person looking for safe, secure and quality stay in Phuket. We stayed at Salafa with two family groups - 10 in total. The house is exactly as described on any booking sites and the staff were so lovely. They were always on hand but we never felt intruded on. Bee's cooking is amazing and she was happy to accommodate all tastes. The beach is a little distance, but we enjoyed our swims there. Mainly spent our time relaxing around the villa pool, while the kids found their way around the compound's two other sizeable pools. It was really quiet during this period and so we had most of the compound facilities to ourselves. The driver and van provided by the Villa was used on a number of occasions and it was no problem to organise a trip anywhere at anytime. Would highly recommend Salafa Villa to anyone wanting a relaxing holiday a little "out of the way" from the usual tourist spots, but within close enough distance to travel if you want to go exploring. 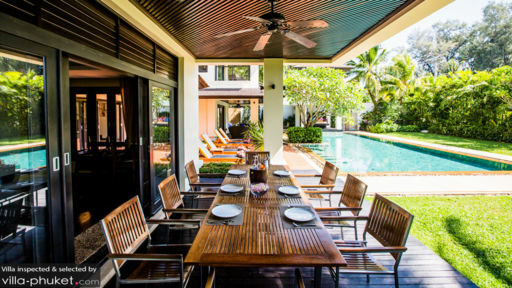 This villa, ideally located opposite Layan Beach on Bang Tao Bay, offers superb accommodation in addition to the luxury of a live in cook, whose culinary skills were superb. Absolutely no need to eat out, the food at Salafa was to die for. The bed was the most comfortable I have ever slept upon. The rooms well appointed and luxurious. You can choose to laze at the villa all day or a driver will take you shopping or sightseeing. Nothing was too much trouble for the staff, they were most cheerful and accommodating, at the same time discreet and non intrusive. It was like staying with the family without the squabbles. The beach is a five minute walk away, and is a rubbish free beautiful sandy expanse, north or south, no hawkers, just idyllic. Highly recommended (from one who is hard to please). I will stay there again. We had a brilliant stay at Villa Salafa. It is a great house with very good sized rooms and plenty of living space. The pool is lovely. The staff are really fantastic and Bee especially went out of her way to help us with anything we needed and cooked great Thai food. We had quite a lot of rain, but it is the wet season! And unfortunately a lot of the local beach restaurants have been closed down by the military but there were some nice beach clubs a short drive away. We had a family reunion for 15 of us at the Villa. The property is beautiful and tastefully decorated. Very spacious for all of us and the service is impeccable. We all arrived from different parts of the world and our airport pick-up was handled professionally and coordinated well so that all of us were picked up on time. The staff is exceptional and Bee is an excellent cook. Noon her assistant and Kim the driver are all wonderful and eager to accommodate any and all of your needs. 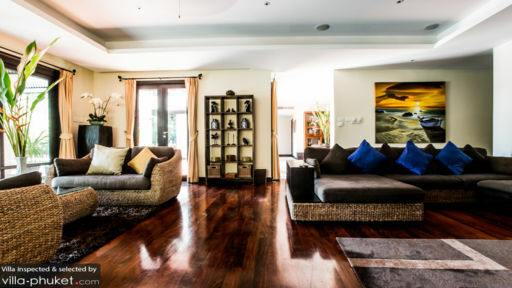 I would recommend Villa Salafa to anyone wanting a memorable vacation in Phuket. Don't stay anywhere else.